I purchased a “Small Accessory Luckpack” from sweet mildred on Etsy as part of her Small Business Saturday Sale. Each pack contained a zipper pouch, and some accessories, and hey were super affordable at only $20 each. You could opt to get one with or without pierced earrings. I selected the “With earrings” option, and here is what I got. 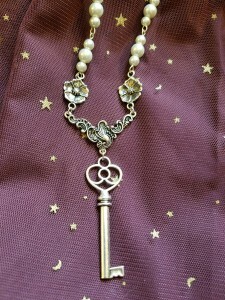 The necklace is silver tone with pearls, and features a key and some beautiful flowers. The motifs are common and universal, so this will be something I can pair with a lot of different options. It’s well constructed, the clasp and charms have some weight to them, and the beads are nice. All in all it’s a solid piece that is worth the price I paid all on it’s own. 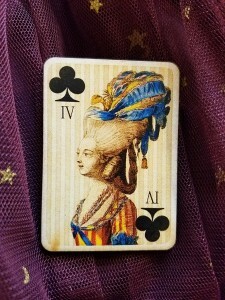 Next we have a wooden pin of a playing card with a really fancy lady on it, who I think might be Marie Antoinette, but I’m really bad at this sort of thing so… it’s at least that time period? It’s got great colors and I love the detailing in the image. It has a pin back and seems quite sturdy. 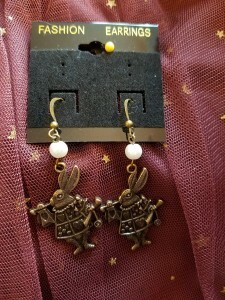 Next we have a pair of earrings with an Alice in Wonderland motif; they feature a rabbit in card suit heraldry blowing on a trumpet. They are brass tone, and on hooks with a little pearl bead on each. Again, they have a nice weight to them and seem to use good quality materials. 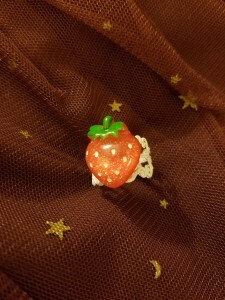 Next, we have a little ring with a glittering pink strawberry on a white filigree base. I love when people use these painted ring bases because I have a lot of metal allergies, and they don’t bother me. The earrings I’ll just paint with nail polish; I do that with even some of the gold or silver ones I buy depending on the makeup. Lastly, we have the pouch. 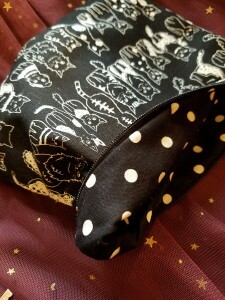 Mine is a black fabric with cats on it on the outside and it’s lined in black x white polka dots. I’ve turned the corner over so you can see it here. There is a black zipper as well. It’s well made and sturdy with a good thickness to it. It would make a great travel pouch for accessories. Value-wise, it’s an exceptional deal. 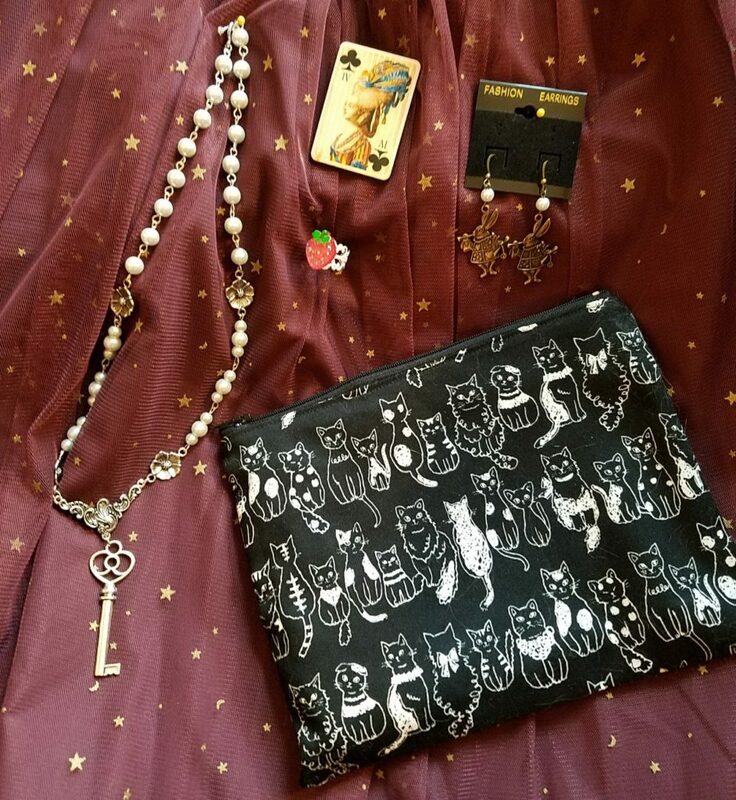 The necklace retails at $25, from what I remember, similar rings to this sell for $5, earrings are $10, pins are at least $5. So even before we add in the pouch, we have at least $45 worth of accessories. All in all, I’m really happy with what I got, and would definitely recommend similar lucky packs from Sweet Mildred in the future.